SIX years ago, colleagues could not understand why Mr Chong Chee Wah quit a "dream job" as head of DSO National Laboratories' information security lab. "It was a comfortable salary, a really meaningful job - we were working with cutting-edge technology," said the 43-year-old, who turned down seven job offers after that, including one with a five-figure monthly salary. Instead, he started a venture capital firm to fund new businesses and went on to add 11 other start-ups to his portfolio. The former Public Service Commission scholarship holder, who idolises Chinese tycoon Jack Ma, told The Straits Times that he views his life in 12-year blocks - and after 13 years serving the Government, it was time for something new. But he did not know what this new challenge would be. A friend recommended that he read The Alchemist by Brazilian author Paulo Coelho - and the book changed his life. "The book says that if you search for something, the stars will eventually align for you to reach that goal... It gave me courage to start searching," he said. In the book, an Andalusian shepherd boy travels through the desert to find treasure and his destiny. Mr Chong feels he has found his own treasure in TreeBox Solutions - one of his 12 companies. He set up TreeBox with four friends in 2011 and together they developed OnTalk, an app that encrypts mobile calls and messages. "At the time, iOS and Android (both mobile operating systems) were taking off and people started using WhatsApp. We knew that as long as people are using mobile devices to communicate, security will always be a concern." Indeed, International Enterprise Singapore - a government agency that helps firms here establish themselves abroad - is working with TreeBox to help it expand overseas. 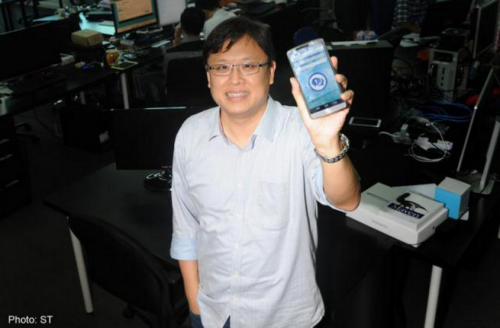 It said there is "huge potential for Singapore companies in the mobile security sector". The TreeBox team worked on a shoestring budget at the start. They did not have an office and met in their homes and cafes. Eventually, they came up with a prototype mobile application that impressed the National Research Foundation enough for it to give them a $500,000 grant. TreeBox co-founder Wendy Chan, 36, said the team trusted in Mr Chong's vision. "He was my mentor back when we were in DSO and I learnt a lot from him," said the former cryptographer, now TreeBox's vice- president of corporate and business development. The company's investors include former Singapore Airlines, Singtel and DBS Bank chairman Koh Boon Hwee, Ang Mo Kio GRC MP Inderjit Singh and former Accenture partner Robert Chew. The firm sells its services to governments in the Asia-Pacific and Middle East and is expected to start turning a profit within a year. But Mr Chong is shy about its success. The father of two teenage daughters said these modest results have come at a hefty price. "I have less time to spend with my family now," said Mr Chong, who lives with them in a five- room flat in Ghim Moh. "My younger daughter is a netball player. In the past, I was able to attend every match she played. Now, it's hard for me." Mr Chong was raised in a three-room rental flat in Holland Drive by his cabby father and mother who worked odd jobs. His wife has supported his career change. He said that one of the reasons he became an entrepreneur was to teach his daughters an important life lesson. "I wanted to educate my two daughters - if they want something in life, they should be confident and go for it. "Everyone should be open to learning and be passionate about what they do. Life is too short to be wasting time."